This angel ornament is made from sea glass by Maria in Trujillo, Honduras. Maria walks daily along the beach for exercise and collects sea glass on the beach. Sea glass is any piece of glass from the ocean that has been smoothed over time by the waves-hitting-beach action. 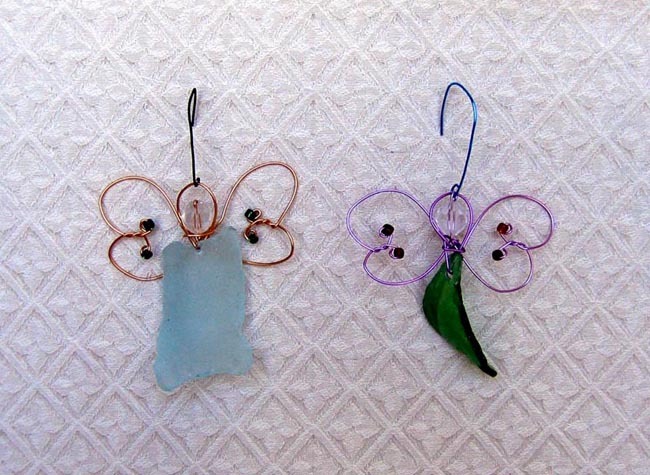 Maria began making dragonflies from pieces of sea glass and wire. We asked if she would try making an angel and she agreed. The angel measures 3 inches wide. Mari (Maria) taught herself to read and write. At the age of 19, she was working on a 2nd or 3rd grade level. Mari went to school, eventually completing 8th grade and then doing a four-year Bible program through her church to be a Christian Education teacher. Maria now has four children (2 girls and 2 boys). Her husband Ale does wooden puzzles, coconut jewelry, and carpentry to support the family when work is not available with a large agricultural company. Maria opened a small corner store in their home that she and Ale built with monies from their craft sales. They also own a few acres of coffee plants on a nearby mountain, so they have a small annual coffee harvest. Mari and Ale would like to live on the mountain with the coffee crops, but there is no education available for their kids up there. Please note that the shape and color of every piece of glass is unique, so the photo is only an example. $4 each. Please click here for purchasing instructions. ​​Special order.